This example shows how to use the Box-Jenkins methodology to select and estimate an ARIMA model by using the Econometric Modeler app. Then, it shows how to export the estimated model to generate forecasts. 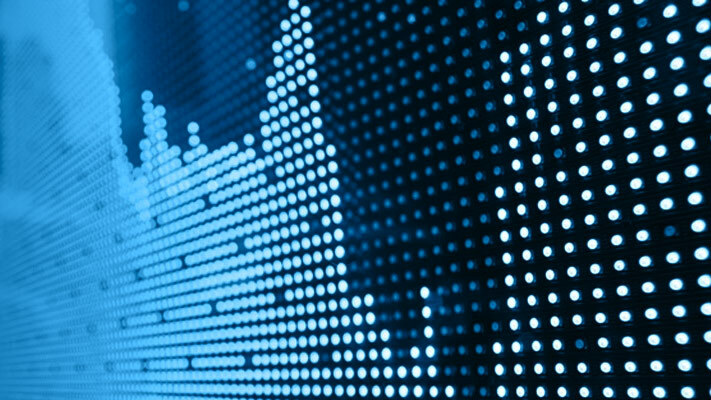 The data set, which is stored in Data_JAustralian.mat, contains the log quarterly Australian Consumer Price Index (CPI) measured from 1972 and 1991, among other time series. 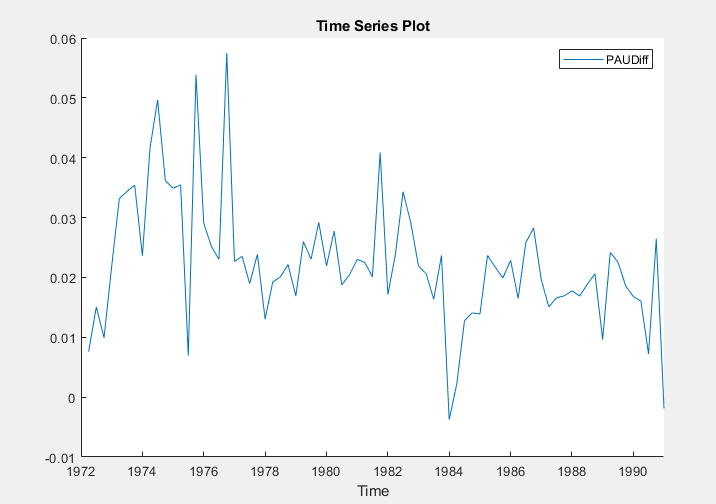 The variables, including PAU, appear in the Data Browser, and a time series plot of all the series appears in the Time Series Plot(EXCH) figure window. The series appears nonstationary because it has a clear upward trend. 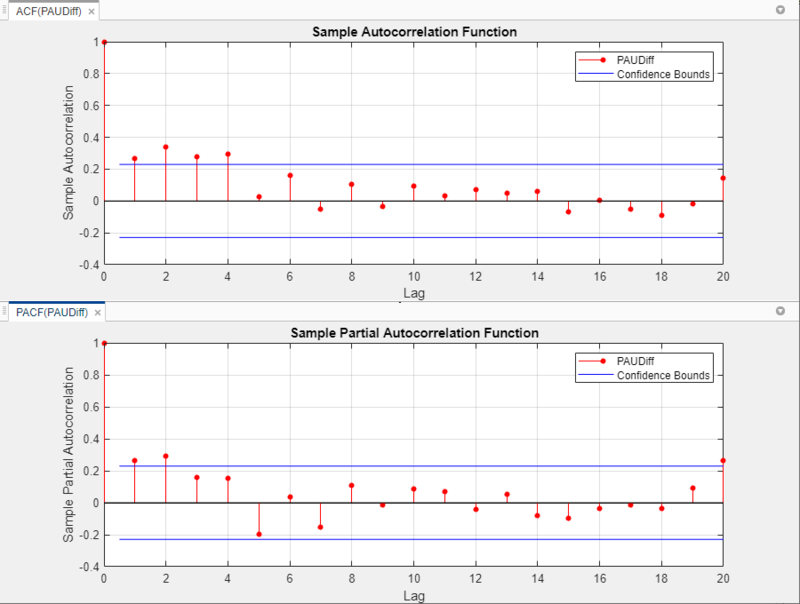 Plot the sample autocorrelation function (ACF) and partial autocorrelation function (PACF). Close all figure windows except for the correlograms. Then, drag the ACF(PAU) figure window above the PACF(PAU) figure window. The significant, linearly decaying sample ACF indicates a nonstationary process. Close the ACF(PAU) and PACF(PAU) figure windows. Take a first difference of the data. With PAU selected in the Data Browser, on the Econometric Modeler tab, in the Transforms section, click Difference. 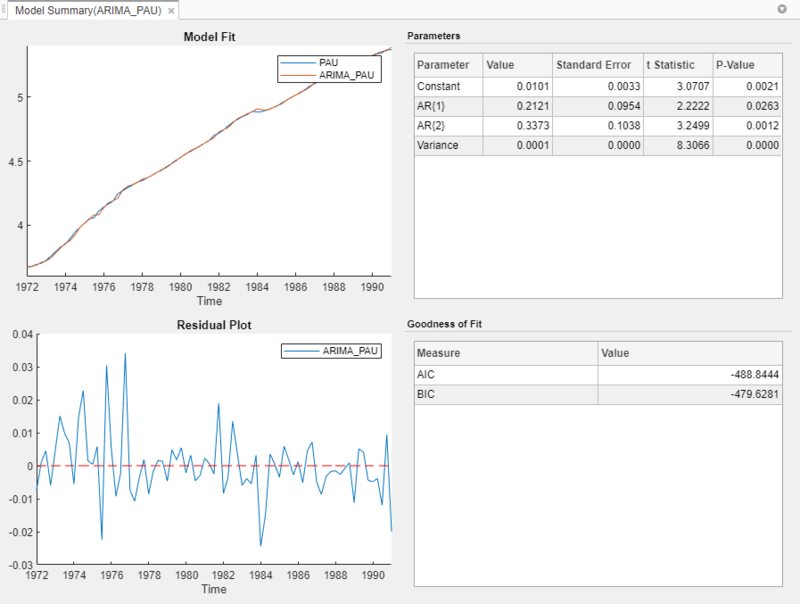 The transformed variable PAUDiff appears in the Data Browser, and its time series plot appears in the Time Series Plot(PAUDiff) figure window. Differencing removes the linear trend. The differenced series appears more stationary. 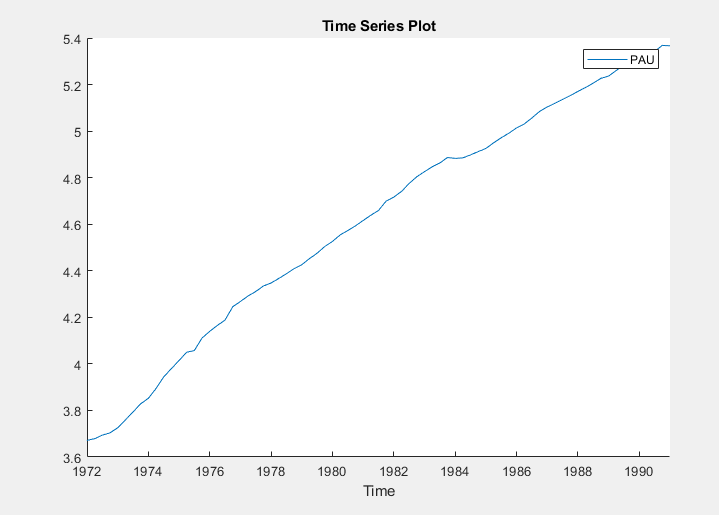 Close the Time Series Plot(PAUDiff) figure window. Then, drag the ACF(PAUDiff) figure window above the PACF(PAUDiff) figure window. The sample ACF of the differenced series decays more quickly. The sample PACF cuts off after lag 2. 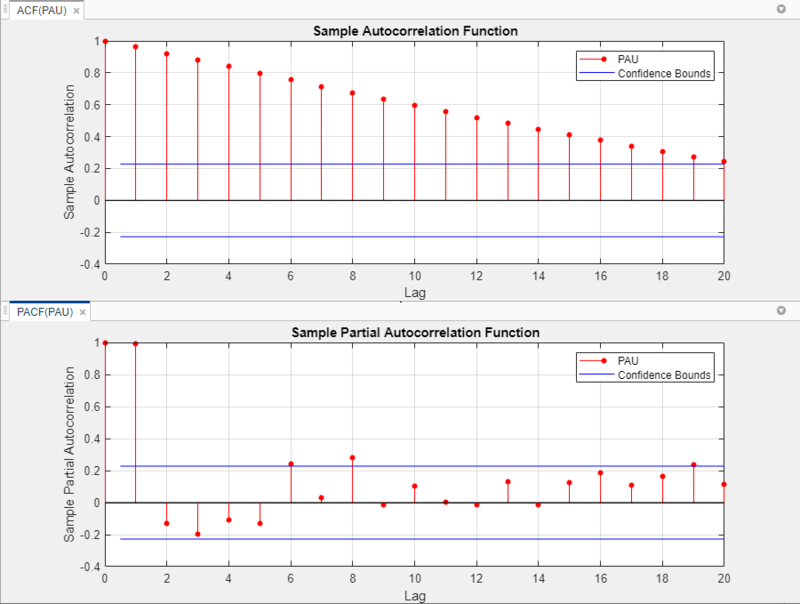 This behavior is consistent with a second-degree autoregressive (AR(2)) model for the differenced series. Close the ACF(PAUDiff) and PACF(PAUDiff) figure windows. 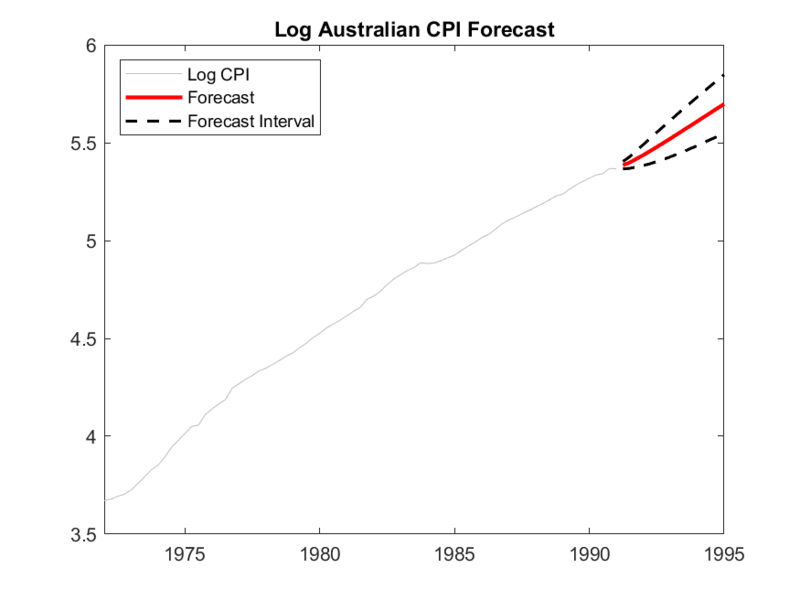 Estimate an ARIMA(2,1,0) model for the log quarterly Australian CPI. This model has one degree of nonseasonal differencing and two AR lags. Set Degree of Integration to 1. Set Autoregressive Order to 2. Both AR coefficients are significant at a 5% significance level. 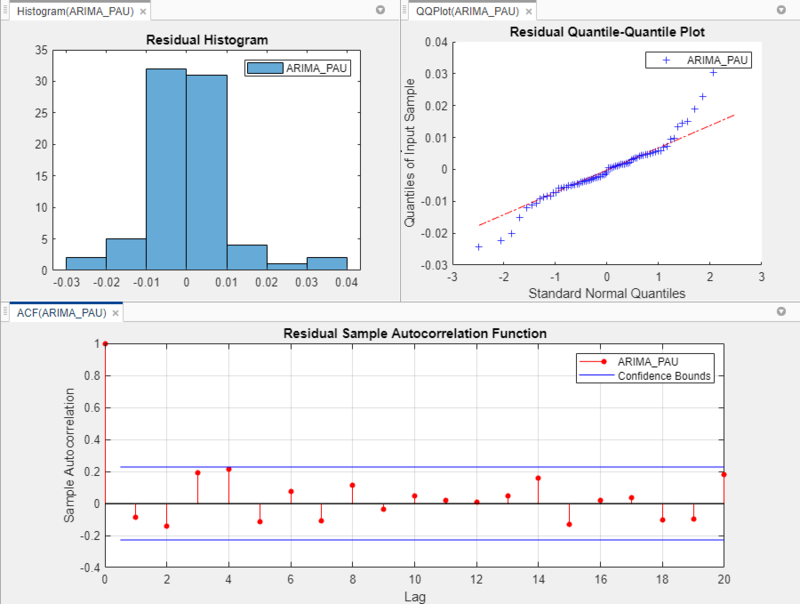 In the right pane, drag the Histogram(ARIMA_PAU) and QQPlot(ARIMA_PAU) figure windows so that they occupy the upper two quadrants, and drag the ACF so that it occupies the lower two quadrants. The residual plots suggest that the residuals are approximately normally distributed and uncorrelated. However, there is some indication of an excess of large residuals. This behavior suggests that a t innovation distribution might be appropriate. 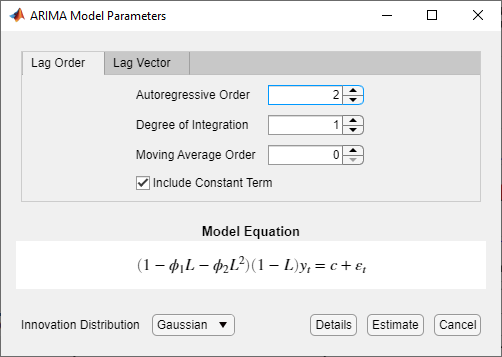 Export the model to the MATLAB® Workspace. On the Econometric Modeler tab, in the Export section, click Export > Export Variables. In the Export Variables dialog box, select the Select check box for the ARIMA_PAU model. Click Export. The check box for the PAU time series is already selected. The variables PAU and ARIMA_PAU appear in the workspace. Generate forecasts and approximate 95% forecast intervals from the estimated ARIMA(2,1,0) model for the next four years (16 quarters). Use the entire series as a presample for the forecasts.